After a long day I want things super simplified when it comes to dinner. I try to cook a homemade meal every night, but sometimes I need a bit of help. There’s nothing wrong with using a boxed or canned item to make dinner easier. I’ve also got a budding chef that’s really into helping right now, so while cruising up and down the aisles at the grocery store, something caught my eye. Chef Boyardee Mac & Cheese. Already made in a can. Sure, I’ve loved Chef Boyardee products forever with their saucy good pastas. But this? Mac & Cheese in a can had to come home with us. 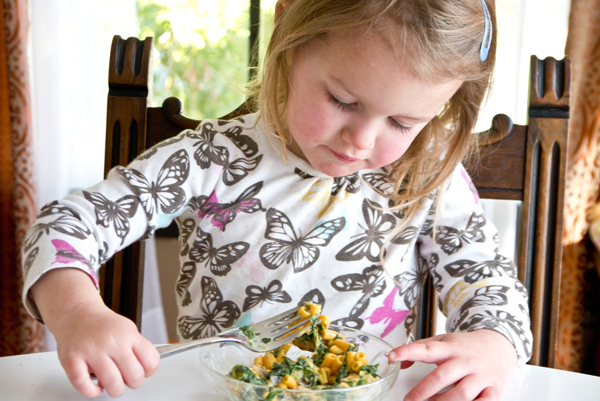 Cooking with your kids encourages them to try new things and also introduces essential kitchen skills. Even young tots like mine can do lots of things to assist with making dinner. I had a tasty idea for using that Chef Boyardee Mac & Cheese, and she could totally help. After getting out a cutting board, butter knife, and a handful of mushrooms, she got busy cutting away while I had time to prepare the rest of the meal without her attached to my leg. The thing is, Chef Boyardee is running a contest right now (December 29 through March 11, 2012) with a final winner getting a year’s worth of groceries and ten weekly $500 cash prizes. If that’s not encouragement to get in the kitchen and get creative with the Chef, I don’t know what is! 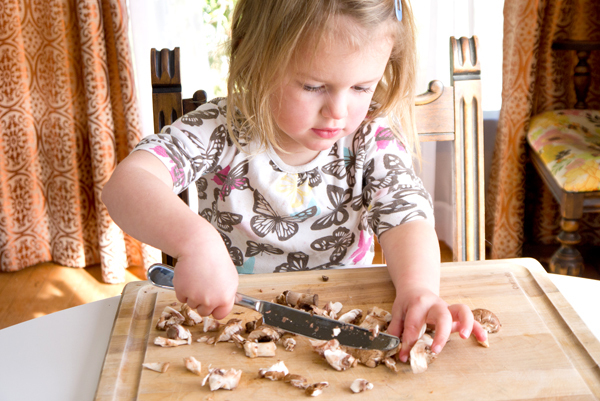 While prepping our dinner I kept finding myself distracted while watching my daughter cut her way through those mushrooms. I was so proud of her and her budding knife skills. She helped me mix things together and then was more than excited to sit down to dinner and enjoy what she had helped to make. This recipe is so good, super easy-and healthy (for real-under 300 calories per generous 1 cup serving and full of vitamin-packed spinach)! This dish, that easily serves six, can be on the table in less than 30 minutes and uses one pan, which makes clean up a snap. Serve alongside garlic toast and a few sliced tomatoes for a complete meal. Place a 12-inch frying pan over medium-high heat and add the oil, chopped onion and garlic and stir. Add the cubed chicken tenders along with the pepper and rosemary and let things brown for about five minutes stirring as needed so the chicken doesn’t stick to the pan. While you’re stirring the kids can chop the mushrooms and squeeze the water from the spinach by pressing it in a colander. Once the chicken has started to get toasty around the edges, add the spinach and mushrooms to the mix and stir. Go ahead and turn off the heat under the frying pan and crank the oven to 400 F.
While it’s preheating, mix in the Chef Boyardee Mac & Cheese along with the sour cream to the chicken. 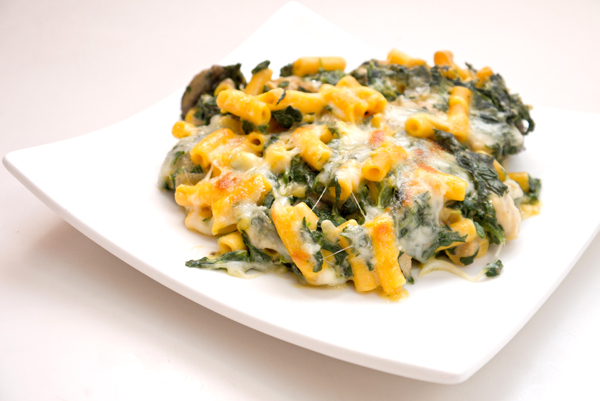 Sprinkle with the shredded mozzarella and pop into the oven for about 20-minutes or until the top is all bubbly brown. Dinner! What’s your favorite Chef Boyardee product? Use it to create your own unique recipe and then share on the Chef Boyardee Facebook page for a chance to win! Enter Chef Boyardeeís Make It Boyardeelicious Recipe Contest from December 29, 2011 through March 11, 2012 for your chance to win free groceries for a year as well as one of ten $500 weekly cash prizes. Then visit Chef Boyardeeís Facebook page from March 26, 2012 through April 8, 2012 to vote for your favorite recipes from the ìMake It Boyardeelicious Recipe Contest.î Each day, one voter will be selected to win a $100 cash prize.